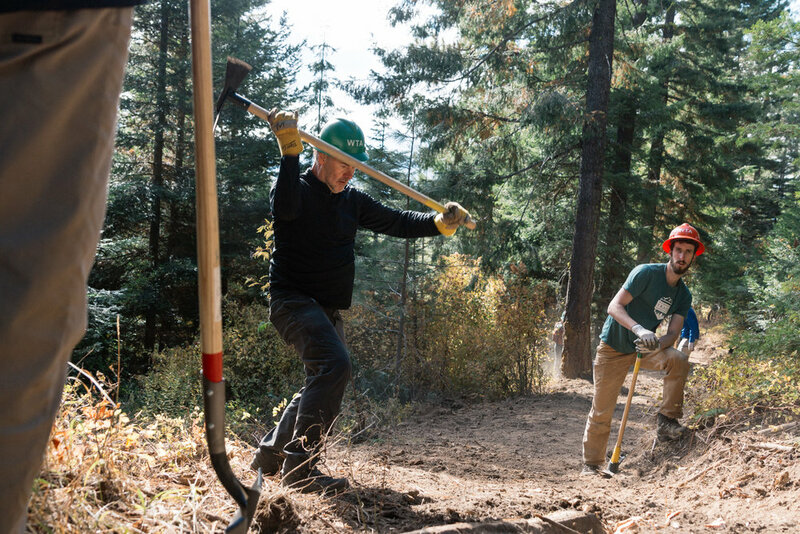 We were thrilled to partner with REI Co-op Tuesday on a trail-building stewardship project, and together constructed the first official trail within the new Towns to Teanaway trail system. More than 300 REI executives and employees from across the country built more than 2 miles of the “Ewok” trail in a key access point for the trail system above the town of Roslyn. Volunteers joined Washington Trails Association expert crew leaders to take the brand-new Ewok trail from roughed-in to finished by working on the trail tread, creating drainage and brushing. They also rehabilitated adjacent sections of trail that needed drainage work and brushing. The Towns to Teanaway Corridor master plan will feature a stacked-loop trail system from Ronald to Roslyn and Cle Elum with trailheads and signed routes originating in each community. Leadership from the Kittitas County Parks and Recreation District No. 1 and strong input from the community led to a final design that includes trails on Nature Conservancy-managed land and other private land spanning the Cle Elum Ridge above Ronald, Roslyn and Cle Elum. Cle Elum Ridge is a beautiful, forested landscape sloping down to the Cle Elum and Yakima rivers. As far back as anyone can remember, the ridge has been used by the community as a recreational asset. The ridge is not only used by people, it is also an important habitat corridor for a variety of wildlife including elk, deer, coyotes, wolves, raptors (including bald eagles), as well as numerous small mammals and songbirds. For decades, recreation and resource extraction (mining and logging) co-existed relatively well. Eventually, the mines closed and the large logging companies left the area. Land on the Cle Elum Ridge and in the Teanaway Valley were put on up for sale for residential development. The community encouraged local leadership to utilize tools such as mitigation or purchasing, as necessary, to offset the possibility for negative impact development on the public’s ability to access outdoor recreation areas. Through multiple community visioning sessions, citizens noted that opportunities for and access to outdoor recreation are the foundation of life as well as economic drivers in Upper Kittitas County. As the land managers, TNC is working to conserve and restore its wildlife habitats and to provide access for the public’s enjoyment. That is why we are proud to be part of the “Towns to Teanaway Corridor” connecting the communities to the Teanaway Community Forest. Existing trails have been developed unofficially over years of use. Many are rutted by motorcycle and off-road vehicle use, some trespass across private property and need to be re-routed, and others are steep, fall line trails, which can cause erosion nightmares. The project now offers a unique opportunity to enhance trails and build new ones throughout the project area for hiking, mountain biking, equestrian riding, cross-country skiing, snowshoeing and snowmobiling. As the full Towns to Teanaway Corridor project is completed, it will provide economic benefits for the local community. Already, Jeff Newman of Tamarack Trail Builders, a new small business based in Roslyn, has a lot of work cut out for him supporting the project. The project will also improve public health and fitness, build community connections, protect important wildlife corridors and generally improve the quality of life in Roslyn, Cle Elum, Ronald and for visitors to those communities. 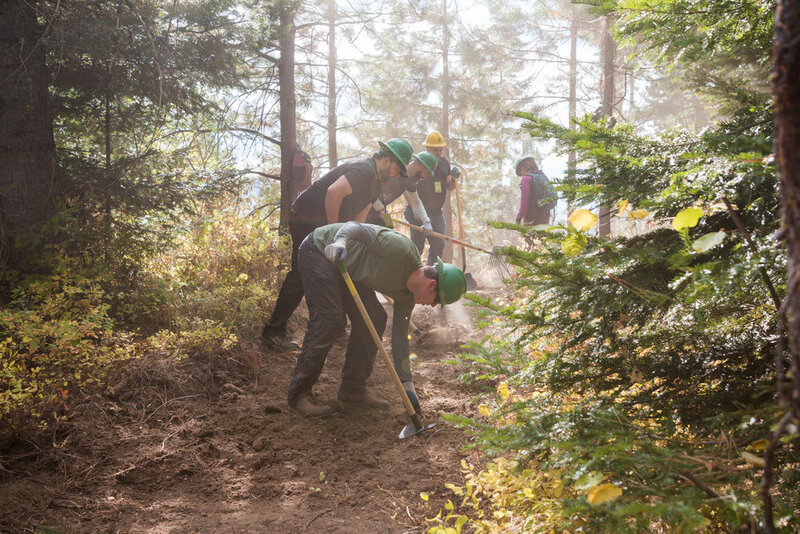 More than 300 REI executives and employees from across the country built more than 2 miles of the “Ewok” trail in a key access point for the trail system above the town of Roslyn. Imagine waking up one morning and finding your neighborhood had been split in two, separated by a moat that is impossible for you to cross. We just received fantastic news this week: The Arbor Day Foundation has fully funded our reforestation proposal in the Central Cascades.